This is our second year to join the community garden. Compared to the last year, the garden looks much better. This year we dug deep to begin with. You really need a lot of power to dig up the ground. My husband who dug loads had lots of blisters. We planted strong vegetables this year such as potatoes, onions, peas, lettuces, and edible chrysanthemums. We went back to the garden last weekend and we found a shoot coming out from the ground. Whoo hoo! My mother planted young plants and they are growing quickly. 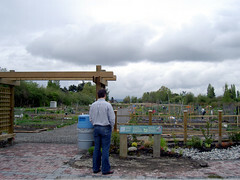 This community garden started to make vegetables by volunteers this year. After the harvest, these fresh vegetables are donated to Food Bank (charity organization which supplies food to the people who need). I hope they can get a good harvest. 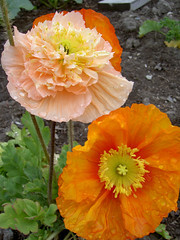 The following is poppy which was flowering in the community garden. This entry was posted in Nature, Vancouver. Bookmark the permalink.